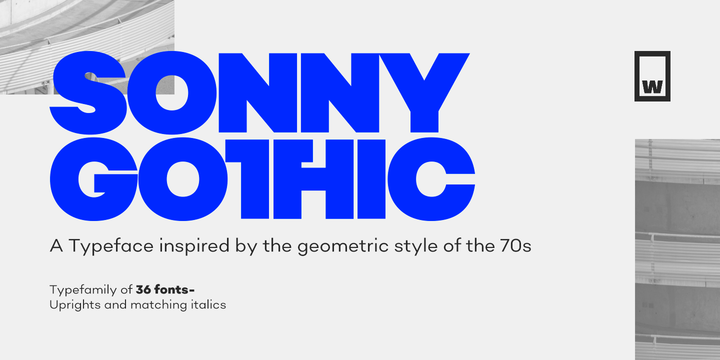 Sonny Gothic is a geometric sans typeface created by Salvador Rodriguez and published by W Foundry which is available in 2 widths (Normal & Condensed) each with 9 weights (from Thin to UltraBlack) and italics. Inspired by geometric style of the 70s, it has a mix between modern caps proportion with the 70s traditional caps ligatures. It has a wide range of OpenType features and multilingual support. It is perfect for graphic purpose, editorial use, packaging, poster etc. Enjoy! Price: starting from $25,00 for one font to $299,00 for all 36 fonts. A font description published on Monday, July 24th, 2017 in Fonts, Salvador Rodriguez, W Foundry by Alexandra that has 4,496 views.